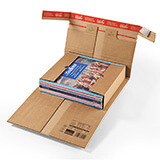 For rapid, self-sealing cardboard boxes, these premium instant bottom and double sealing boxes can’t be beaten! 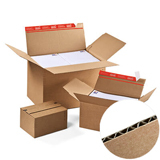 These white ColomPac® premium quick instant base boxes have an instant bottom and self-sealing strips on top that make them extremely quick to erect and save additional sealing materials. Available in 4 different modular sizes they are easily stackable and suitable for a variety of items including clothing, books, CDs, DVDs, and more. 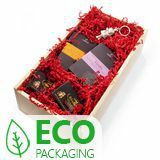 ColomPac® are one of the most trusted names in packaging and these white boxes, like all ColomPac® boxes are cleverly designed not only to make them quick and easy to put together but also to open with their integrated tear open strip. The innovative Z-folding cover design provides higher stability and helps to prevent content removal from the sides. 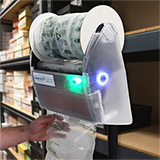 If your customer changes their mind the second self-sealing strip makes for simple and secure return shipping. 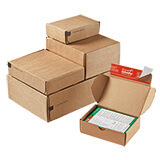 These white instant-bottom boxes are not only extremely quick and easy to use, they also require no additional sealing materials. Supplied flat-packed they are space saving until required and the modular design provides for easy and neat stacking.